• ✅ 2 PADDED MOISTURE RESISTANT INNER COMPARTMENTS with INTERIOR POCKET Makes This Bag One of The Best Satchel Bags for Men and Women. 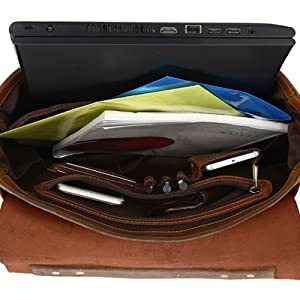 Its Versatility makes it a Great Gym Bag, A Laptop Messenger Bag and/or Computer Messenger Bag. It’s perfect for Tablets, Netbooks & I Pads. • ✅ MOBILE CELL PHONE POCKET, PEN MEMORY DRIVE POCKETS, CREDIT CARD SLOTS. Special Arrangements have been made to carry your Credit Gym Library Cards with Place for your Phones, Pens. • ✅ 2 EXTERNAL POCKETS. If Storage is your need then this bag will top all lists. With it’s two external pockets you have extra storage with quick access. • ✅ MULTI-USE, COURIER, CROSS BODY or SHOULDER BAGS Adults of all ages, Teens and College kids. Can Be Used as a Travel, Hiking or School Bag. Great for Business or Personal. Spacious size with a wide. 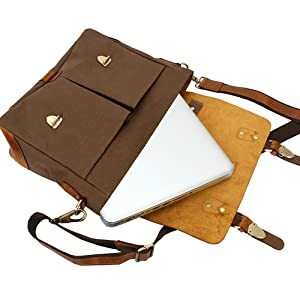 Ideal for 13 inch Laptop, Macbook ,etc. Can also additionally store files, books, smart phone, tablet, laptop charger, etc. Very spacious and keeps your stuff organized with 2 Big compartments. Separate slots designed for 1 Mobile Phone, upto 3 Pens, 4 Cards/ Ids holder. A Fair Trade Product Made from Canvas and Genuine Leather. 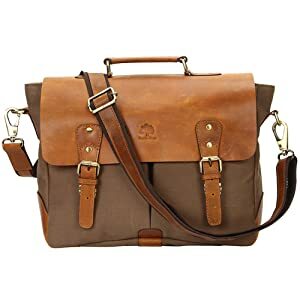 This Rustic Town messenger laptop bag is handcrafted from canvas and genuine leather using a natural tanning process, making it perfectly safe for the environment. Further, the leather is polished off using a special vegetable oil that makes it fine for you to use the bag during rains. 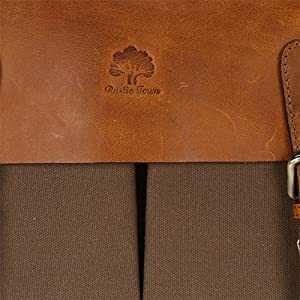 The base of this messenger bag is made from canvas while the flap, shoulder straps, handle and buckle flaps are all made from pure leather. This bag is stitched using high-quality thread and features brass buckles and grommets that ensure long life. 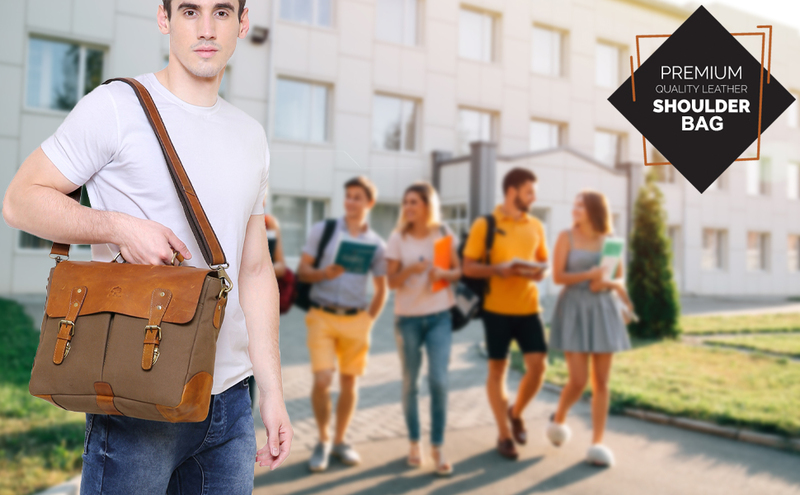 Whether you’re college freshman or a working professional, this messenger laptop bag is trendy, stylish and perfect for your lifestyle. The leather flap cover and canvas bottom offer plenty in terms of style to suit everyday usage. Sturdy brass button details add a stylish look to the bag. 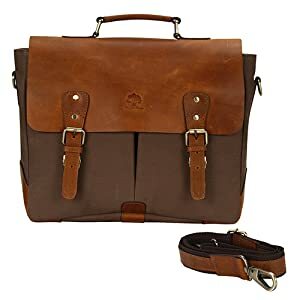 This Rustic Town messenger laptop bag has a padded laptop compartment in addition to two larger compartments that can store books, files and folders. It also has an internal zippered pouch for small items and separate slots for cards, pens, mobile phone and stationery supplies. This bag also has two slide pockets in the front and a full-length pocket on the back that provide additional room for all your things. Whether you’re looking for a bag to carry your everyday essentials for work or packing for a short weekend getaway, this messenger bag has enough room to store all your essential supplies.